Figure 1: Creating a chorus effect by 'dividing down' master oscillators.These small discrepancies — which were not even identical from note to note — were not dissimilar to the differences between the pitches of two pipes tuned to the same pitch, or between the three strings that comprise a note on the aforementioned Bösendorfer. Consequently, manufacturers began producing electric organs that generated a primitive chorus effect using dual sets of dividers. 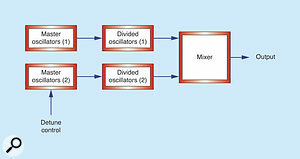 More sophisticated designs incorporated two independent sets of master oscillators, each with a set of frequency dividers, and some even offered a global detune for the second set (see Figure 1). 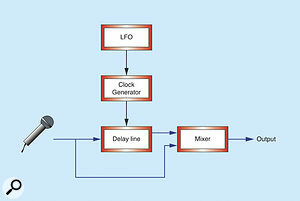 Figure 2: A modulated delay line.Figure 2 shows the structure of a modulated delay line. 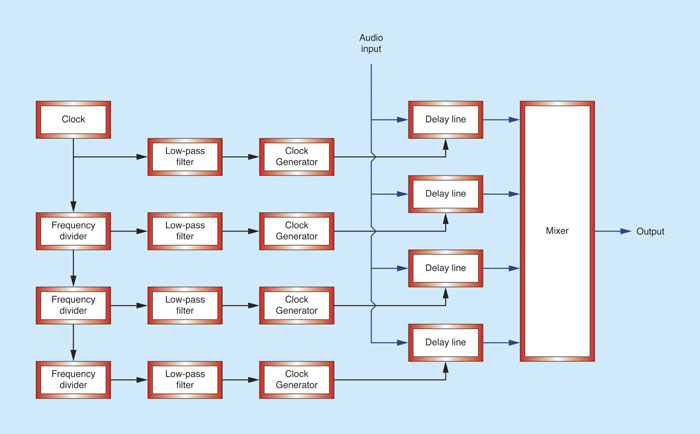 You can present any signal to the input, whereupon it will be low-pass filtered to eliminate aliasing, sliced into samples, and then passed through the line before being reconstructed at the far end. This, by the way, is as true for a digital delay as it is for an analogue BBD. 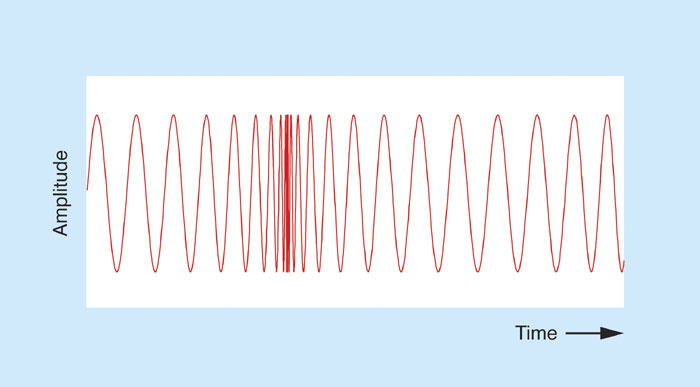 The speed at which the samples travel down the line, and their precise temporal relationships (ie. 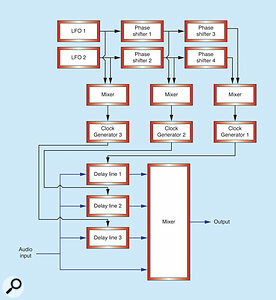 how far apart they are spaced) are determined by the clock generator and the oscillator modulating its speed. I hope that it is obvious that, if the clock is running faster when a bunch of samples reach the end of the line than it was when they entered, the samples will be closer together, so the pitch will be higher. Conversely, if the clock is running slower when those samples reach the end of the line, the samples will be further apart, so the pitch will be lower. 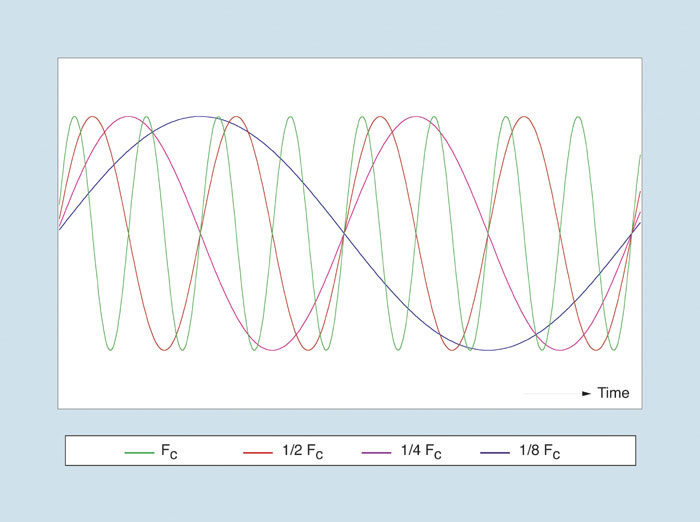 Clearly, this allows us to modulate the pitch of the signal, and if the LFO in Figure 2 were generating a sine wave, the output from this diagram would exhibit a pronounced 'wow' effect, like a vinyl record with the hole punched in the wrong place. 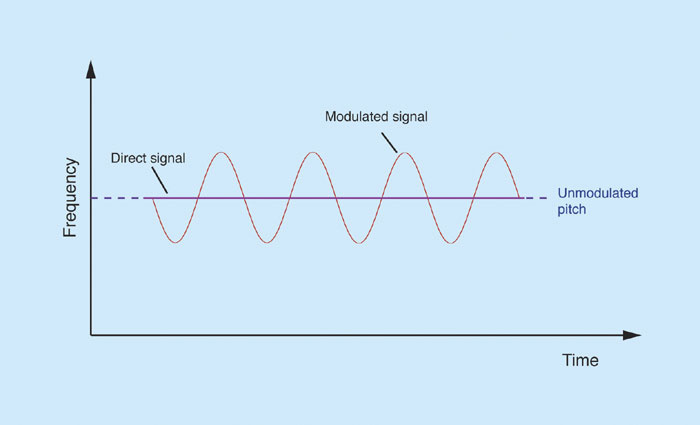 Figure 3: Adding the unaffected signal to the pitch-modulated signal. 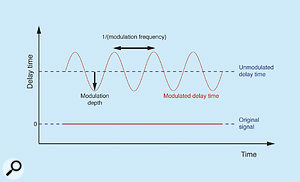 Figure 4: A simple delay modulation. Figure 5: The pitch-shifts resulting from the modulation in Figure 4.Now, let's add a second signal path to Figure 2, which allows the unaffected signal to pass to the output, as shown in Figure 3 above (from which, for clarity, I've omitted the anti-aliasing and reconstruction filters). 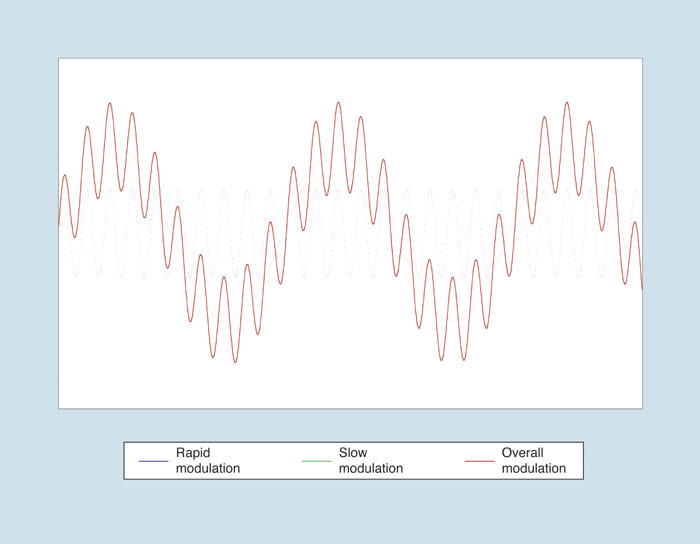 We now have the situation where the modulated signal is sometimes at a higher pitch than the 'straight-through' signal, sometimes at a lower pitch and, on two occasions in each cycle, at the same pitch. 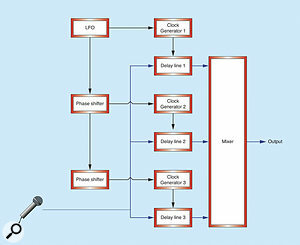 Figures 4 and 5 (below) demonstrate this, showing how the delay in the upper signal path changes in time, and how this affects the pitch relationships between the upper and lower signal paths. 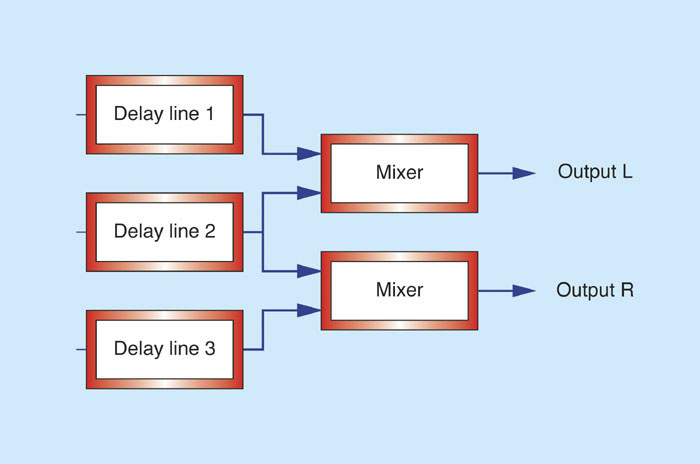 Figure 6: A simple, two-path chorus unit.Of course, this patch will produce nothing like the desired effect unless we choose our parameters sensibly. Firstly, you'll find that the barest minimum of modulation is needed. If you can't obtain a low enough modulation level from the Level knob on the LFO, place an attenuator in the modulation signal path to reduce the amplitude even further. In contrast, you have a wide choice of modulation rates. A slow sweep at a fraction of 1Hz will provide a gentle chorus, while a faster rate — say, 5Hz to 7Hz — will result in a more typical 'synth' ensemble. The other vital factor is the delay time. Set this to be too long, and you'll hear a distinct delay. Set it too short, and you'll obtain a version of another effect: flanging. But get it right — somewhere in the range 10ms to 50ms, as your taste dictates — and then mix the two signal paths in equal measure, and you'll obtain a serviceable chorus, reminiscent of the cheapest '70s string synths. Hang on... the cheapest '70s string synths? 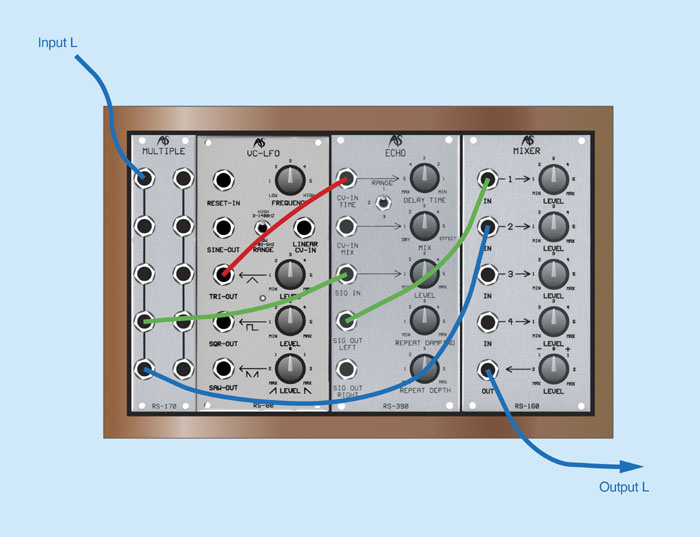 The individual modules in this patch (or an equivalent software modular synthesis application) could cost a couple of hundred quid, so you've a right to expect something a bit better. What's going on? 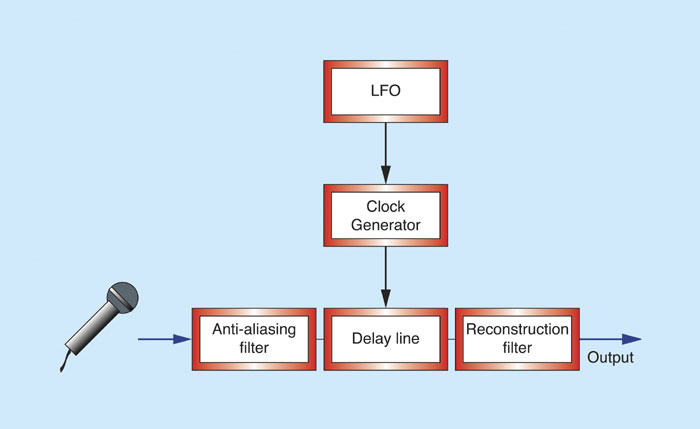 Figure 7: Using a single LFO to modulate three delay lines.I have shown an efficient way to do this in Figure 7, which shows that we can use a single LFO to modulate each of the delays, provided that the phase of each instance of the LFO waveform is shifted by some amount. Without these shifts, the three audio paths would be modulated identically, and we would create vibrato, nothing more. If the three paths are modulated at relative phases of 0 degrees, 120 degrees and 240 degrees, we obtain the pitch relationships shown in Figure 8. As you can imagine, this is a far more complex sound, and the relationships between the three modulated signals provide a thicker and warmer chorus effect. Figure 8: The frequency modulations of the three signal paths in Figure 7.The chorus described in Figures 7 and 8 is a classic '70s design, and was used in numerous string ensemble keyboards, but it still does not have the richness and depth that we have come to associate with the best of such effects. 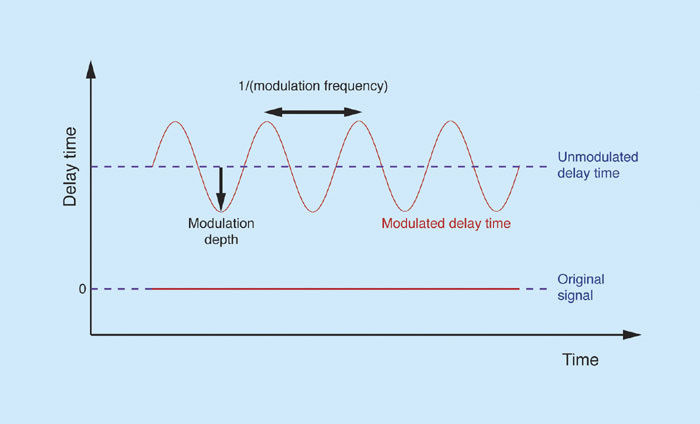 This is because synthesizer designers continued to dream up better ways to modulate the input signal, the first of which was to modulate each delay line with not one LFO, but two. This was conceptually simple, although debate raged over the speed and depth that creates the most pleasing effect. 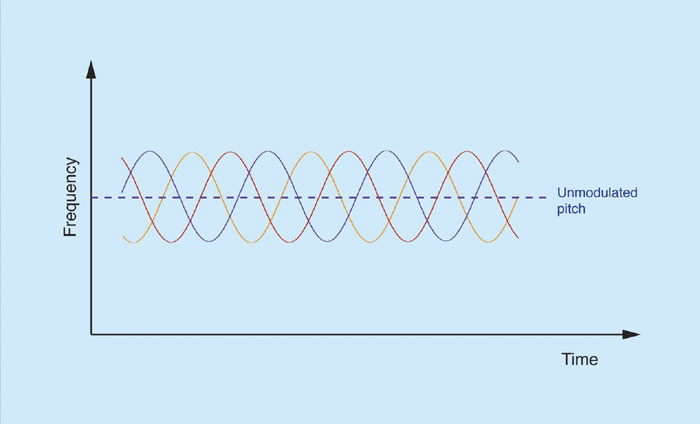 Many manufacturers opted for two very different speeds — one of the order 0.5Hz to 0.7Hz, with a second closer to 6Hz to 7Hz, but with no discerned integer relationship between the two, so that the modulation didn't repeat for a long time. 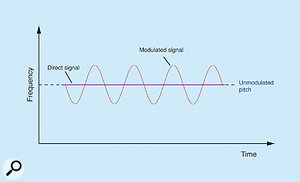 Figure 9 shows two such waves, and the resulting modulation signal. As you can appreciate, it's going to be more difficult for Ugg the Caveman to perceive this as a simple, repeating waveform. 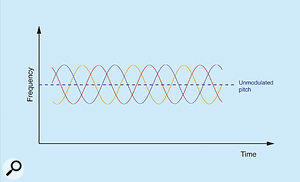 Figure 9: Creating a more complex modulation from two sine waves. 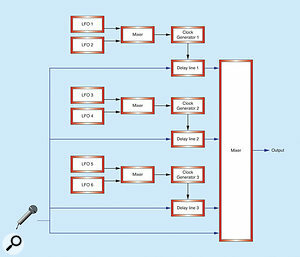 Figure 10: A four-path chorus unit. Now consider Figure 10. This shows the input split into four paths — the original signal plus three delayed versions of it. 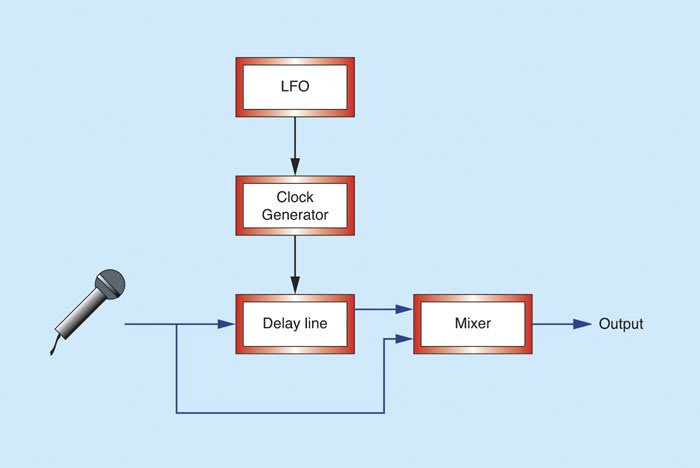 Each of the six LFOs in the patch can have a different modulation rate, and each of the mixers in the modulation paths can be designed so that each of the LFOs contributes a different depth. The result is a lush, complex swirl of sound that is forever evolving, and which adds movement and texture to even the most basic of initial waveforms. 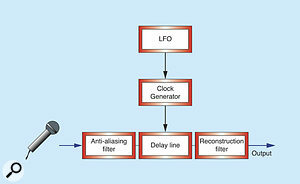 Figure 11: Reconfiguring the LFOs to produce a modulation signal with vibrato. 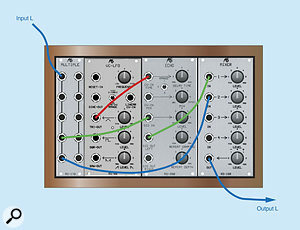 Figure 12: Modulating the speed of the modulator.As you might imagine, circuits such as Figure 10 can be expensive to build, and although this design produces a superb ensemble sound, it may not be economical. To overcome this, many manufacturers combined the ideas set out in Figures 7 and 10, employing a trick that fools the ear into believing that it's hearing multiple, complex modulations, when in fact only one is present (see Figure 13, below). 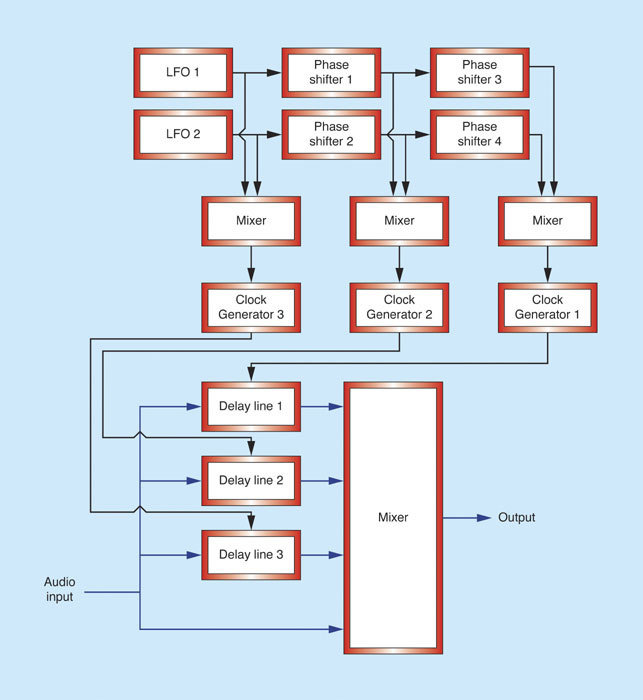 This involves the use of just two LFOs (which cuts costs) and four phase-shifters (which are cheap), and generates three instances of a single complex delay modulation. As before, these are out of phase with one another, typically by 120 degrees, and the result, while not quite as lush as you can obtain using six independent LFOs, is nonetheless gorgeous. This is why this method — or close variations of it — became the standard for almost all the best-loved chorus/ensemble keyboards. 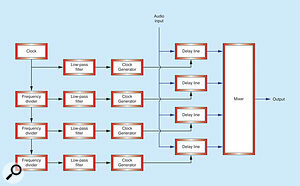 Figure 13: The classic three-phase chorus unit. As we now appreciate, stereo chorus is the classic synthesizer effect, and it's easily created if you have access to the signals being produced by the multiple delay lines. 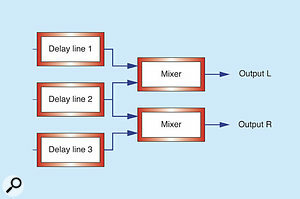 Figure 14 shows a triple-path configuration in which the signals generated by the first and second delays are mixed and sent to the left output, while the signals generated by the second and third delays are mixed and sent to the right. In this scheme, you can leave out the 'straight-through' signal, because the dual inputs to each mixer will be chorusing differently, and — far from contributing to the result — the original might actually damage the impression of width and depth. Figure 14: The output stage of a triple-path stereo chorus unit. Figure 15: A 1978 chorus design by Roland Corporation.One of the cleverest of chorus designs was developed by Roland (see Figure 15). This uses just a single square wave LFO (generated, would you believe, by one of the flip-flops that I described a couple of months ago) and three frequency-dividers that output modulation signals at the clock frequency Fc, at 1/2 Fc, 1/4 Fc and at 1/8 Fc. These 'square' signals are low-pass filtered to 'round off' the waveforms into approximations of sine waves, and these are in turn used to modulate the clocks driving four BBDs. The outputs of the delay lines are then mixed into a single sound, and emerge in glorious mono. 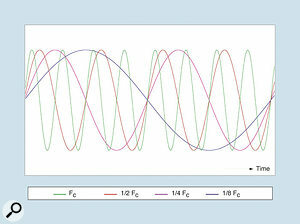 There is no 'straight-through' signal present in the output. 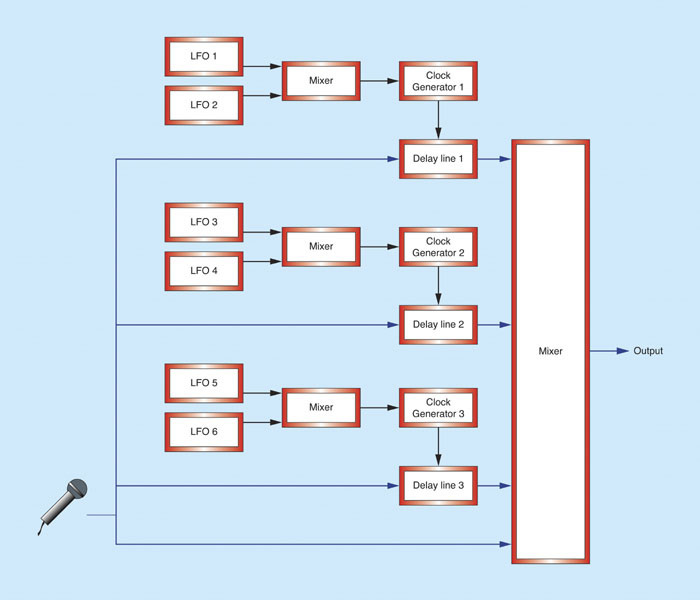 Figure 16: Converting the Roland chorus in Figure 15 into a stereo unit.Roland even suggested ways in which Figure 15 could be improved. 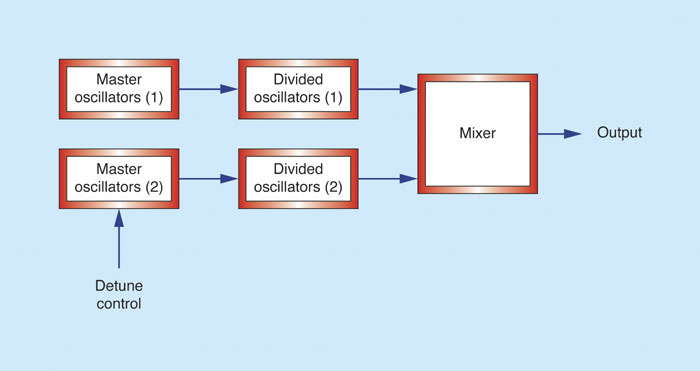 For example, you could mix the outputs from the first and third BBDs and from the second and fourth, to create a stereo chorus (see Figure 16). The designer also suggested inverting the phase of the second and fourth modulating waves to create an even richer 'spread' of the ensemble effect, and using frequency dividers that used other integer factors of Fc, such as one third or one fifth. 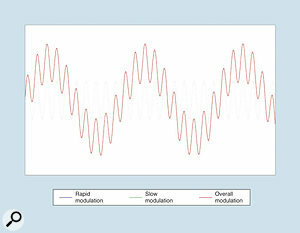 Yet another Roland design dispensed with sine-wave modulators and substituted sawtooth waves, eliminating the pitch discontinuities by modulating a set of VCAs that silenced the delay lines while the modulating waves reset to the start of their cycles. 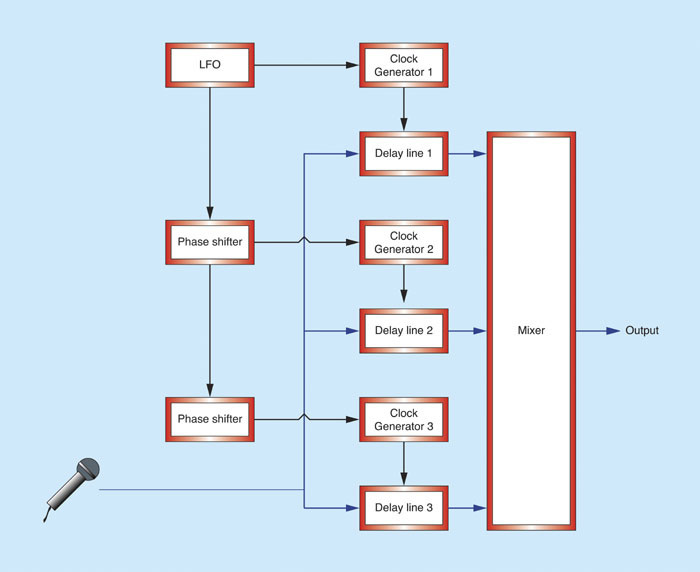 Yet another incorporated signal gates that disconnected the modulation waveforms when there was no audio signal present at the input, thus eliminating the characteristic 'swishing' noise that mars many chorus effects. The permutations are almost endless. 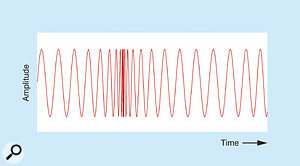 Figure 17: The modulations generated by the clock and dividers in Figure 15.Despite the obvious benefits of chorus units, BBDs are rather noisy, so many (although not all) 1970s manufacturers treated them as a necessary evil that added interest to cheap, single-oscillator keyboards and synthesizers, but which were not suitable for top-of-the-range instruments. But while the high-brow approach was good in principle, the synthesizers that eschewed chorus and relied on other techniques to create lush sounds were expensive: multiple VCOs per voice, the ability to detune independent banks of oscillators against one another, the ability to modulate the pulse width of one bank and the frequency of the other... it all added up.